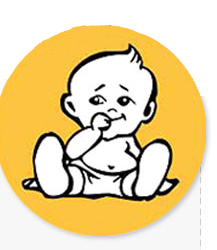 A 1991 study among diaper service customers found that babies wearing exclusively cloth diapers from accredited diaper services, were five times less likely to develop rashes. Our diaper service exceeds the sanitary requirements of hospitals in laundry specifications, and we randomly test our diapers for a variety of strict guidelines and to ensure the diapers match the pH of baby’s skin. Disposable diapers may cause skin irritations and rashes from skin sensitivity to the diaper’s perfumes and/or chemical additives. Also, rashes may be caused by the excessive heat built up from prolonged wear of soiled diapers that “feel” dry. Because home washers and dryers are not commercial grade, the water is not hot enough and the drying not hot enough, home washed diapers tend to cause more skin irritations and rashes due to residual detergent and bleaches still in the diaper, following the laundry process. Diaper service diapers are a reusable product. The natural resources in cloth diapers produce a product with a life span measured in years, not hours. Once retired, cloth diapers become excellent cleaning cloths for even more years of practical use. Compare this to disposable diapers that are used a single time and for only a few hours. 1. Disposables produce 60 times more soled waste. 2. Disposables use three times more energy. 3. Disposables consume 10-20 times more raw materials. 4. Disposables use two times as much water, even when growing cotton is factored in. Home laundered cloth diapers share many of the environmental benefits of diaper service diapers, especially in that cloth diapers are reusable. However, home washed diapers use significantly more water and energy than a diaper service because of the economics-of-scale that diaper services achieve when they wash over 600 pounds of diapers at a time. Diaper Service offers pick up and delivery of a complete weekly supply of diapers to your home. Most parents find that cloth diapers – either with pins and plastic pants, or with pin less covers – perform very well to contain soiling and to keep outer clothing clean. Most disposable diapers are packaged so that parents will need more than one package of diapers per week to have enough. Most name-brand disposables have a chemical based reaction that transforms liquid into gel. While super absorbant diapers may feel “dry” when soiled, they should be changed as often as cloth. Except for the time and energy devoted to home washing, home-laundered diapers offer the assurance of never running out of diapers. But most cloth diapers available through stores are of a lighter grade than the diapers from a diaper service, so absorption can be inferior.